Really? Well then everyone is wrong. 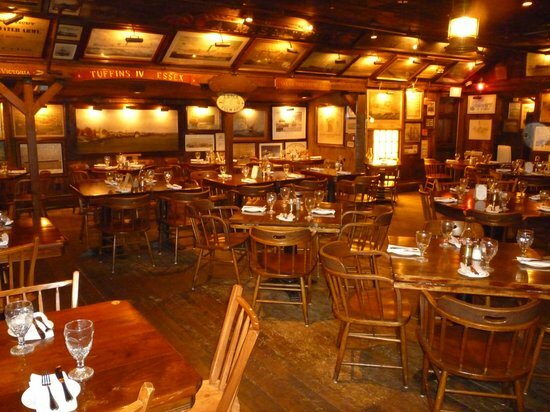 First of all, the Gris is hardly any ol’ restaurant – it has been around and fully operational since 1776. SEVENTEEN SEVENTY-SIX. 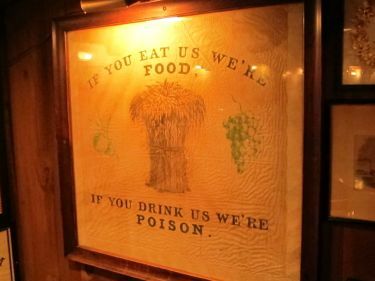 That makes it supposedly the oldest continuously operating inn in America. 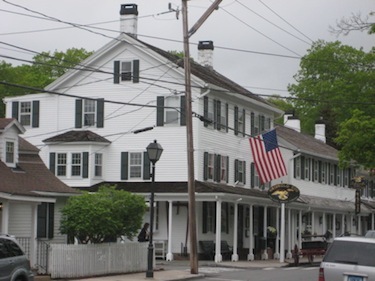 THE OLDEST CONTINUOUSLY OPERATING INN IN AMERICA! I already have a page on the site about that aspect of the Gris. You should actually go read that page first. I won’t be rehashing much of that here because this page exists to treat the place as a museum. The owner (and friend of CMTQ) Geoffrey Paul reached out to me directly and told me about their “museum quality” collection of art and ephemera and I remember poo-pooing it in my head. So yeah, I was one of the “stupid everybody” at one time as well. Fortunately, Geoff won me over via email and I happened to note one of the free art tours he offers was upcoming and voila! There I was sipping wine with 20 retirees waiting for the tour to begin. Me and my people… What’s up. Geoff (I forget, he may prefer Geoffrey… if so, sorry) began the presentation with an off-the-cuff explanation about what an inn is and was in America. My tour was only a week after the devastating Hurricane Sandy and the Gris was without power for several days but only suffered a broken window. 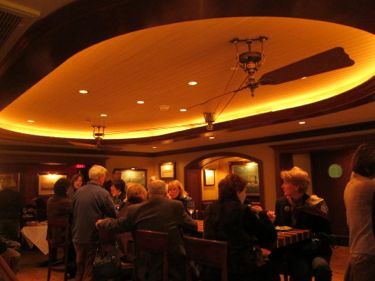 Even in 2012, the inn becaume a meeting place for townsfolk to share stories and help each other out in a difficult time. It became – as it was 200+ years ago – the town bulletin board once again. Through the 90 minute tour, Geoff weaved in the interrelated histories of the Gris, of Essex, of steam travel and of the country itself. After all, the Gris shares a birthday with Uncle Sam. On January 31st, 1776, the Colony of Connecticut authorized the building of its first warship for the Revolution, the Oliver Cromwell. Charged with this mission was shipbuilder Uriah Hayden of Essex (then known as “Saybrook”) who quickly hired tradesmen and contracted with suppliers to outfit the vessel. Essex, perfectly situated for shipbuilding, suddenly experienced an economic boom as the Hayden’s housed the shipyard workers, and provided food, spirits and lodging to the suppliers, politicians and any other patriots who would visit. 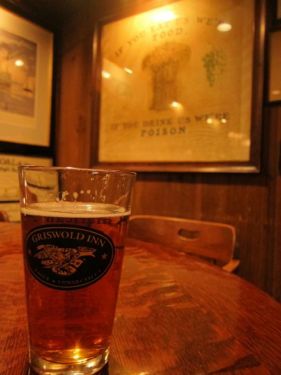 The need for a new tavern and inn arose to handle the influx of men – hence, the Griswold Inn was born. The Oliver Cromwell was successfully launched on June 13, 1776. I have a little bit more about the ship here. Essex is also near the old Boston-Post Road where Inns were necessary. This kept the joint going. 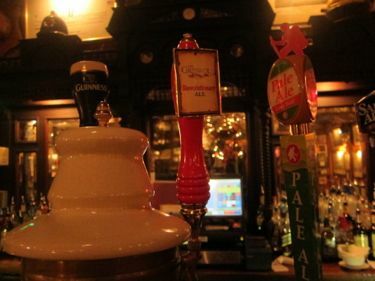 And going and going… through the War of 1812 when the British launched a devastating attack on Essex… and through Prohibition when, well, when Connecticut only had 6 officers assigned to temperance and was never really all that serious about it. The Gris kept going through the Depression and continues even now, as Essex has become an enclave for wealthy yachtsmen and the like. 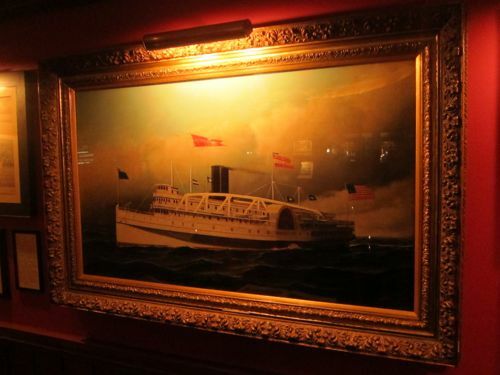 The Gris has three museum-quality collections: Guns, History of Essex and “The history of steam boating on Long Island Sound and the Connecticut River.” As for that last bit, the Gris houses the best collection of it i the world. That is not an exaggeration at all. This is an amazing place. Geoff is an excellent tour guide and gifted communicator. Funny, intelligent and informative; although he’s a restaurant owner who works in finance at his day job, he’s one of the best museum tour guides I’ve ever met. He guided us through the real history of the steam boat. About how South Windsor’s own John Fitch actually invented the thing many, many years before Robert Fulton got the credit. In fact, another Connecticut native, Samuel Morey of Hebron also invented the steam boat but he died young and penniless. Some jerk financier named Robert Livingston had worked with both Fitch and Morey, pretty much bought their patents and designs and ultimately worked with the Robert Fulton everyone knows and loves as the inventor of the steam boat – 30-some years after Fitch steamed up the Delaware River in his own creation. Ridiculous. The tour starts in the new(ish) wine bar at the Gris. It’s an absolutely beautiful room. I usually do this earlier in my write-ups, but I must apologize for the terrible pictures yet again. I didn’t want to use flash photography simply because I didn’t want to annoy my fellow tour-goers nor did I want to upset or disrupt Geoff. My pictures are a disservice to the beauty of this room. 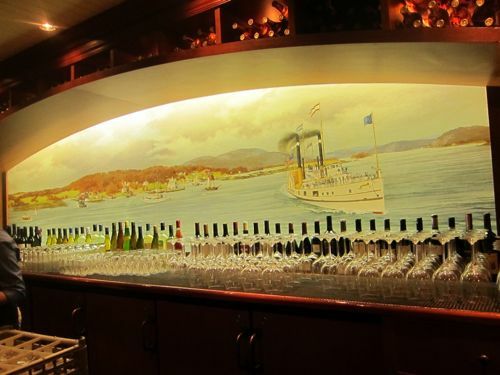 The mural itself actually slowly rocks side to side to mimic what you’d see from a steam ship! I loved it. Loved it silly. Also at the wine bar bar is a sketch. An original Norman Rockwell sketch of what he said was one of his favorite paintings – Steamboat Race on Connecticut River, c. 1940. This was Rockwell’s final sketch before the “real thing” was painted. The original was thought to have been lost to fire, but it ultimately turned up and went to auction. I had no idea, but the largest Rockwell collector in the world other than the Rockwell Museum are two guys named Spielberg and Lucas. 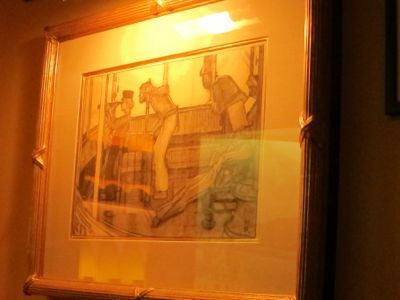 They bought the original for $2.2 million bucks – Geoff stated that as much as that painting meant to him and the Gris, those two would have never lost out to anyone else. Oh well, having the final sketch is important enough. 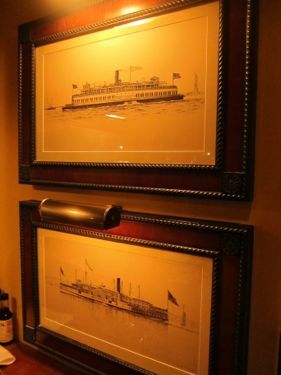 In fact, when asked if a steam boat bell hanging on the wall was “of significance” Geoff answered, “everything is of significance.” He went on to note that while not everything at the Gris is a masterpiece, everything there has some importance to Essex or the Connecticut River. From there, we went on to learn a lot about the history of steamboat and nautical paintings. Have you ever heard of John Bard? Or Antonio Jacobsen? I hadn’t either, but both are well-known painters and both specialized in steamboat paintings. There are about 640 Bard steamboat paintings – all of which are in museums. Except the ones here at the Gris. The restaurant also has 30 Jacobsens – the largest collection of his stuff not in a museum. That’s pretty darn amazing when you take a second to think about it. We learned about each artist and his style (Jacobsen apparently had others do “his” actual paintings) and what makes their works more or less expensive. One nice Jacobsen at the Gris is the “City of Worcester” which is notable because it was the first steamboat wired with electricity. And since the concept of that was so nascent, it was wired by none other than Mr. Thomas Edison himself. While Geoff was regaling us with stories of other painters like Samuel Ward Stanton (the Gris has a couple “very rare” pen and inks of his) who was in Spain researching subjects to paint before returning halfway (or so) home on the Titanic, I became lost in all the little trinkets hung around the restaurant. Like an old steamboat menu from the Connecticut River that offered something called mock turtle soup. Delicious. Into the second dining room of the tour, we checked out some early Currier prints. He started off “in steamboats” before teaming up with his friend Ives. The Gris has original Currier prints that are rather rare and coveted. I sort of got lost in the atmosphere for a bit while Geoff explained early print-making processes and how Currier and Ives capitalized on it. Harpers Magazine was involved and commissioned watercolors that were used for those early prints. There are only about 2 dozen of these in existence. 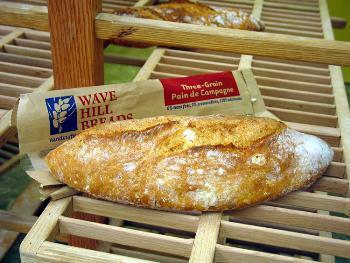 Geoff wove interesting stories into the art narratives. 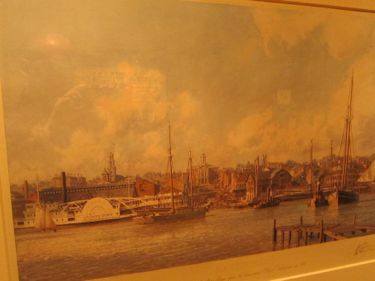 I’ve already mentioned a few, but another one that bears mentioning involves the City of Hartford steamboat that was owned by none other than William H. Goodspeed of, of course, the Goodspeed Opera House. It was steaming down the Connecticut from Hartford to Middletown to check out the brand new opera house in East Haddam when it crashed into the railroad bridge connecting Middletown and Portland. No one died, and the accident was sort of kooky as the bridge slowly pinned the beautiful ship to the river bottom, but it was reviewed by a federal review board who decided that every bridge must have red lights on it so ships can see them better. 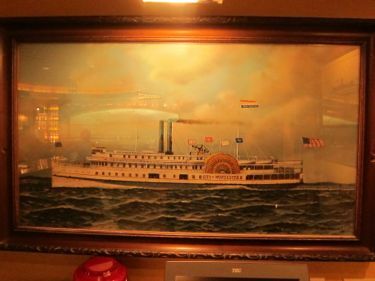 We moved out to the reception area of the inn, but not before taking in the Gris’s “masterpiece.” A Jacobsen 3/4 view large painting of “The Steamboat Connecticut.” It was the last of the great paddle-wheelers and was sort of obsolete before it was operational. But it was named The Connecticut, and that’s important to Geoff. And that was cool until 1912 and Samuel Ward Stanton and The Titanic. The tour wrapped up in the large back dining room. This room is filled, literally, floor to ceiling (including ceiling) with nautical art. Interspersed among the paintings are some 6 Jacobsens and other master works. It’s sort of crazy this is “just” a restaurant. It’s a beautiful room that one can get lost in for a long, long time. Museum folk come here all the time to view the collection and almost can’t believe it. The unique thing about the Gris is, it being so old, many of the paintings on the wall are in situ. That is, Jacobsen was painting when some of his paintings were hung here. 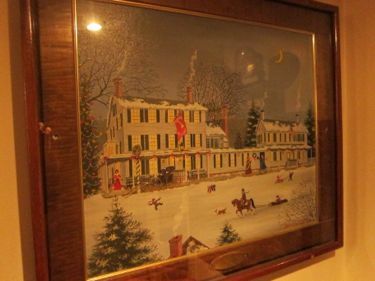 Currier and Ives were alive and printing when their prints adorned the walls at the Gris. That’s pretty nuts. Also nuts, there are a bunch of old 19th century temperance banners from Essex. This dining room is beautiful and historic – and I’m sure the food eaten here is delicious to boot. A couple more quick little stories from the Gris – of which I’m sure there are many, many more – that will sort of blow you away. I can’t imagine how many diners chomp down their prime ribs and potatoes yapping about their kids’ soccer games and have no idea they’re sitting 5 feet from, oh I don’t know, maybe the orginal bill of sale for the Oliver Cromwell mentioned earlier. 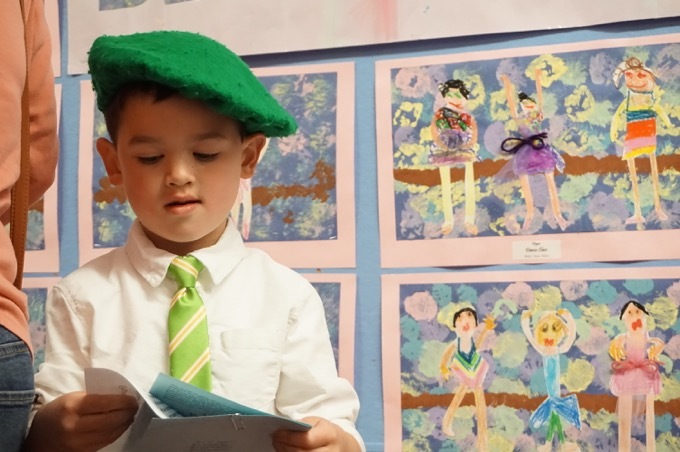 Or perhaps that guy over there with the cod is sitting below the original document from the Governor of Connecticut explaining that Nutmegger Benedict Arnold had turned traitor. 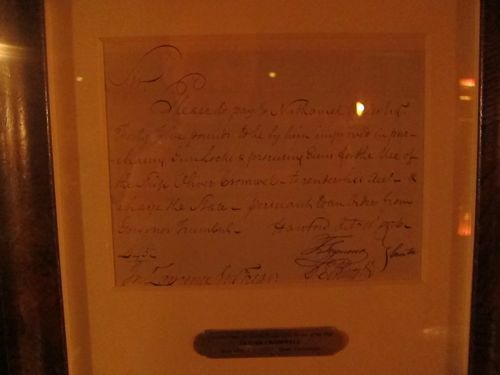 Oh look, those women downing too many glasses of pinot grigio are sitting under that framed poem by a father to his son found in an old Kentucky rifle as the boy was heading off to war… The boy was 15 and the poem is dated 7/7/1776. As I said many paragraphs ago, Geoff lives in Los Angeles most of the year, but flies back here several times and gives these tours. I can’t tell you when they will be, but I can tell you that they will be. And I can also tell you that you really, really should go to the next one you see being offered. 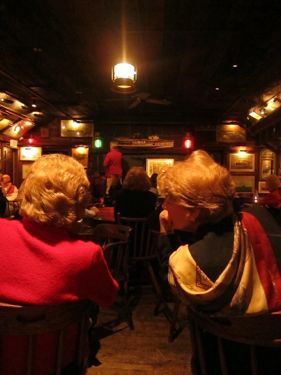 And then stick around for dinner and a drink and a sea shanty or two. Two comments, neither of them intended to detract from the Griswold Inn or your article. * James Rumsey beat both Fitch and Morey to the design and demonstration of a functional steam-powered boat (1784-1786) on the Potomac River near present-day Shepherdstown, West Virginia. Some guy in France may have beat him though. Any which way, Fulton was a douche. * I couldn’t help thinking of National Lampoon’s Vacation whenever I saw Griswold.